Angelina Jolie or Lady Gaga? Angelina Jolie graced Disney's D23 expo Aug. 10 to plug next year's Maleficent, in which she plays the titular Sleeping Beauty enchantress. 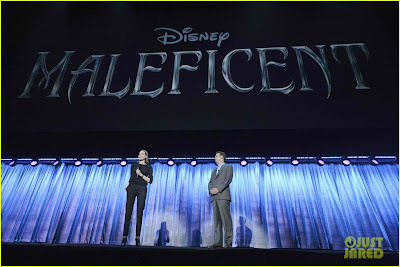 Disney Studios honcho Sean Bailey was also present to unveil a teaser, showing Maleficent as she bestows her curse on the infant Aurora. A beautiful, pure-hearted young woman, Maleficent has an idyllic life growing up in a peaceable forest kingdom, until one day when an invading army threatens the harmony of the land. Maleficent rises to be the land’s fiercest protector, but she ultimately suffers a ruthless betrayal—an act that begins to turn her pure heart to stone. Bent on revenge, Maleficent faces an epic battle with the invading king’s successor and, as a result, places a curse upon his newborn infant Aurora. As the child grows, Maleficent realizes Aurora may hold the key to peace in the kingdom—and perhaps to Maleficent’s true happiness as well. “Maleficent” is produced by Joe Roth and directed by Robert Stromberg, with Angelina Jolie, Don Hahn, Matt Smith, Palak Patel and Sarah Bradshaw serving as executive producers. Linda Woolverton wrote the screenplay. 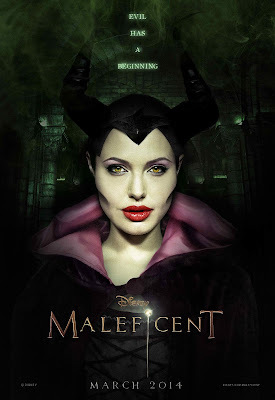 “Maleficent” opens in theaters on July 2, 2014.